Satan's get infest the world. Blood-drinking demons and savage creatures prey on good Christians or lead them to heresy. Even the Holy Mother Church itself teems with devils in man's flesh. But God Almighty has seen fit to choose some to stand against the tide of darkness. With sword and torch in hand, we search out the evil that lurks in the night. 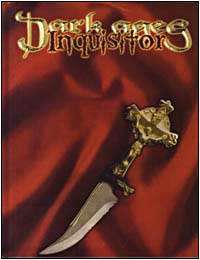 Dark Ages: Inquisitor is a book for playing members of the Inquisition in the Dark Medieval world. Members of secret orders operating by papal sanction, Inquisitors hunt the devils and degenerates who prey on men and defy God, from blood-crazed vampires to pagan warlocks. Inquisitor provides complete systems for making characters (from wielders of holy magic to warrior-monks), a whole new system for blessed abilities, and much more. This books requires the use of Dark Ages: Vampire.